The testo 340 can help reduce energy consumption and improve industrial boiler efficiency. A service technician's job is never over. Despite the longevity of industrial boiler systems – often 30 to 40 years on average – the combustion technology needs constant monitoring to ensure optimal efficiency. Commissioning and servicing take various forms, but monitoring flue gas in particular can lead to financially valuable discoveries that can help to curb energy consumption down the line. This type of detailed examination can't be found without a reliable and accurate instrument like the testo 340 flue gas analyser. Maximising the efficiency of an industrial boiler system comes from understanding where heat and energy loss are taking place. The combustion chamber remains an excellent start, though the flue gas duct is also a viable option. 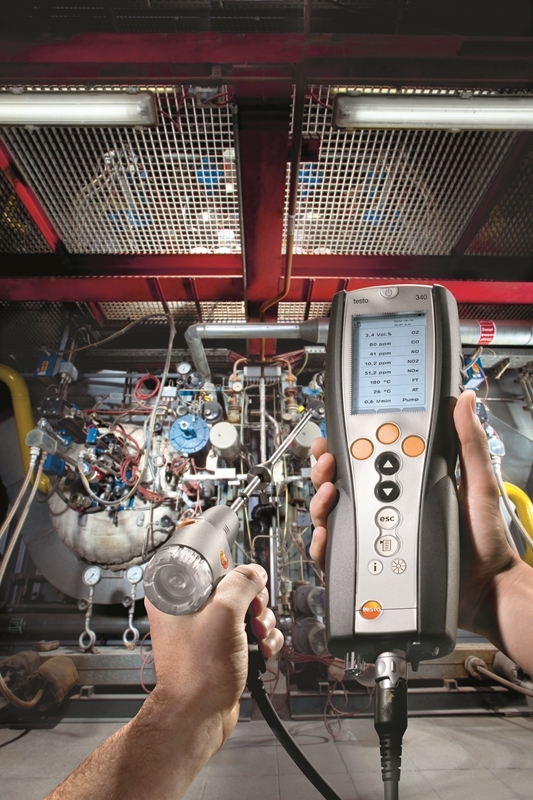 The testo 340 is ideal for regular industrial boiler maintenance. The goal of it all is to limit the amount of unused air in the combustion process. As more oxygen makes its way out of the duct, so too does the energy along with it. Monitoring the temperatures in the chamber is just as important – the lower the better, as it staves off heightened burning rates. Throughout it all, technicians must also ensure emissions are at optimal settings. Failure to do so could result in a compliance infraction, meaning they also have to have an adaptable tool that can quickly conform to this very purpose. The aforementioned is why many service technicians rely on the testo 340 flue gas analyser. It allows them them to quickly identify the efficiency of the industrial boiler system by assessing up to four gases simultaneously. It comes pre-calibrated and takes little to no maintenance, which ultimately improves the speed at which they can take readings. Industrial boilers can reduce energy consumption through flue gas analysis. With digital readings of flue gas analysis, engineers are able to make educated decisions on site as to how to optimise fuel quantity use and combustion air output. This is also possible because there is no fear the instrument wasn't calibrated correctly, and the self-cleaning PTFE hose doesn't allow particulates to stick. Given that it's a muti-sensor analyser as well, service technicians are able to monitor emission values all in the same commissioning. When it comes to a task as complex as maintaining the efficiency of industrial boiler systems, the simplicity provided by the testo 340 flue gas analyser can make everything all the easier. Contact a Testo representative today to learn more.